Watercress is part of the cabbage family of plants, and in China it was originally known as the ‘vegetable from the western ocean’ to which many believed was brought overshoe by the Portuguese sailors. The appearance of watercress does not vary, with the leaves normally having rounded leaflets that are dark green, with the occasionally hints of purple or bronze like colours. Watercress is available all year round, however, it is cheapest during the peak season (mid-winter). 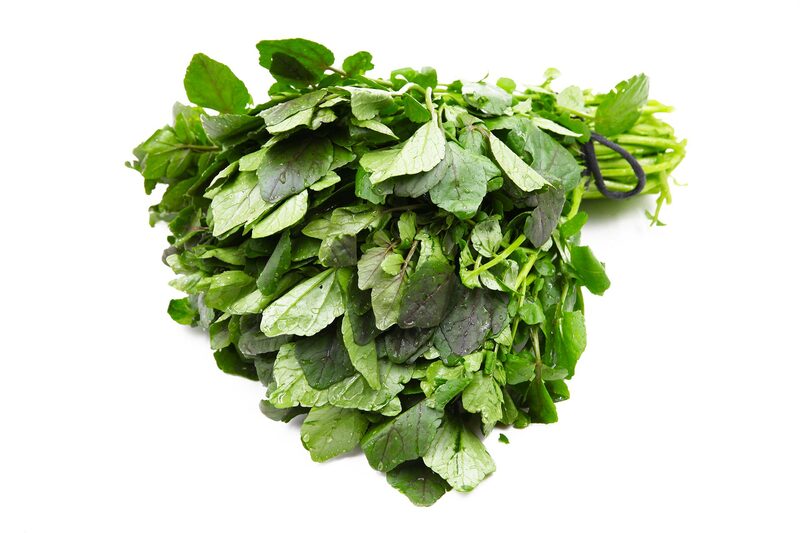 Watercress also has a very distinctive flavor, with many comparing the taste to that of pepper. Similar to it’s relative, the radish, watercress’s taste gets more potent the hotter the weather is in its growing climate. This means that during the peak of summer is when the taste is at its strongest. Not only does watercress have a powerful flavor, but it has numerous health benefits being incredibly nutritious. Watercress contains high amounts of Vitamins A, C and E; and iron and calcium. To prepare watercress for cooking, one must begin with soaking the watercress, making sure to wash carefully as not to damage the leaves and then shake off to dry or wrap carefully around in kitchen roll. From there, one can chop coarsely or as desired, and discard with the stems. When cooking with watercress it is vital that one cooks quickly as not to destroy the leaves and its bitter chemicals, which would release a nasty taste if so. Similar to its familiar vegetables and herbs, watercress has an abundance of uses within cuisine. Watercress can be eaten raw as a salad herb, added into salads or sandwiches; or cooked as a vegetable. For example, watercress is often incorporated into soups and into stir-frys. It is also common to include watercress in traditional tarts or omelets to add more potent flavor. ©2015-2016 Choysum.org. All Rights Reserved.